Hiking in Thórsmörk (þórsmörk in Icelandic) is one of the best things to do in Iceland. 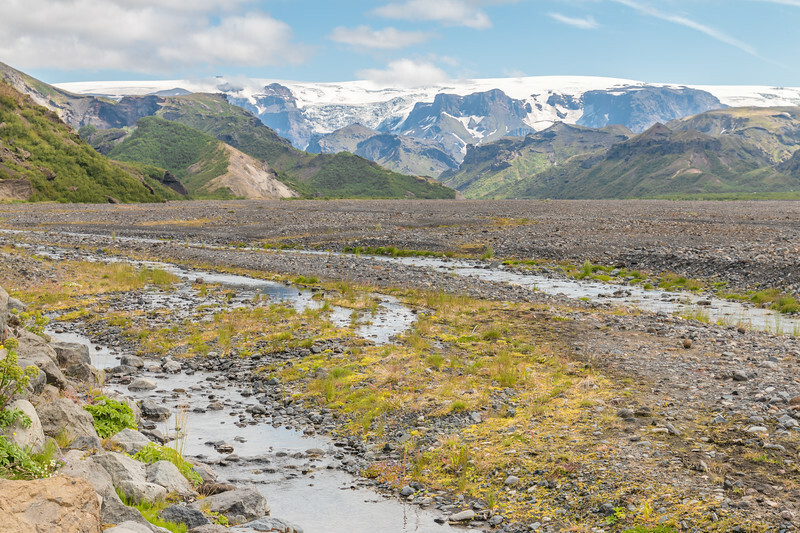 Thanks to a diverse landscape with forests, rivers, gorges, and glaciers, Thórsmörk offers many trails and hiking opportunities including some famous long-distance ones such as Laugavegur or Fimmvörðuháls, but also some short ones suitable for those on a day trip. Thórsmörk is a nature reserve in the highlands of Iceland which is part of a wider area known as Goðaland (land of the gods), an area of exceptional beauty consisting of a mountainous landscape with three mighty glaciers, Tindfjallajökull, Eyjafjallajökull, and Mýrdalsjökull. A place not to be missed if you enjoy the outdoors! Thórsmörk is not that far from Reykjavík (only 150 km). However, the rough road F249 with its dangerous river crossings makes access impossible for regular cars or even small 4x4s. The first rivers are usually negotiable in regular 4x4s but the mighty Krossá river, at the entrance of Thórsmörk, is deep, fast, and dangerous. So, if you’re driving, you need a proper 4×4 with high clearance and river crossing experience. If you’re unsure, better not do it. 1 – Drive your 4×4 to the car park just before Krossá river and hitch a ride across or use the wooden pedestrian bridges (seasonal). 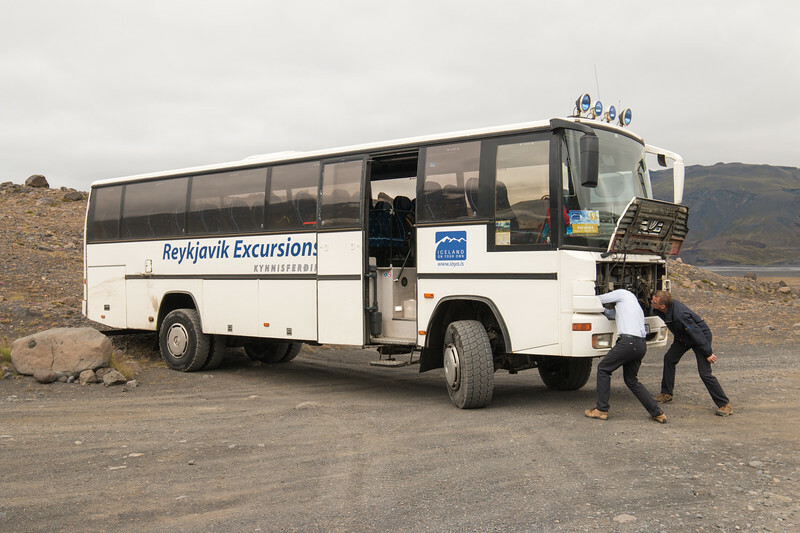 2 – Take the bus which departs from Reykjavík and stops at well-known locations such as Selfoss, Hvolsvöllur, or Seljalandsfoss, giving you the chance to park your car and join along the way. Check Trex or Reykjavík Excursions for timetables and prices. Not available in the winter. 3 – Super Jeep tour with one of many existing companies that do day trips to Thórsmörk. 4 – Hike in. Not the easiest, but you can hike from Skógar or Landmannalaugar (more below). 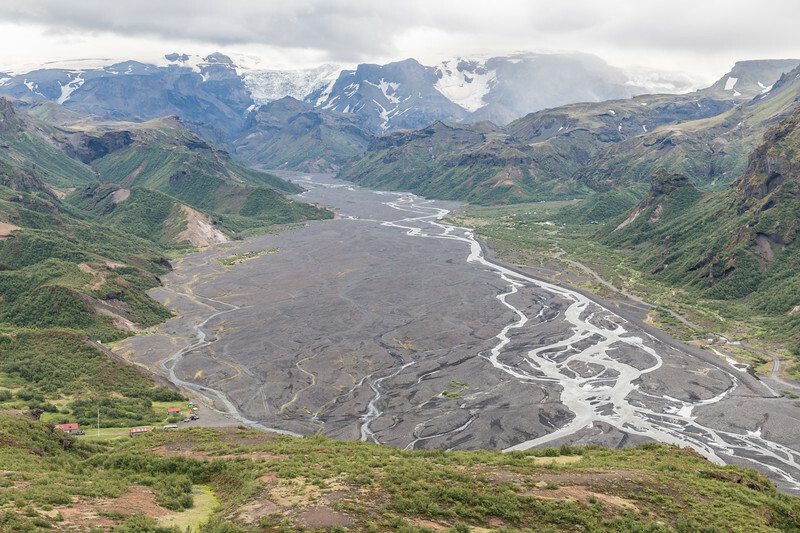 Once in Thórsmörk, there are 3 bases: Húsadalur, Langidalur, and Báusar, with the first two across the Krossá river. All offer accommodation options in the form of camping or huts. At Húsadalur, you can find Volcano Huts which is now the defacto headquarters for a good number of adventures in Thórsmörk. They have different types of accommodation, a restaurant with really good food, and also sell hiking maps. 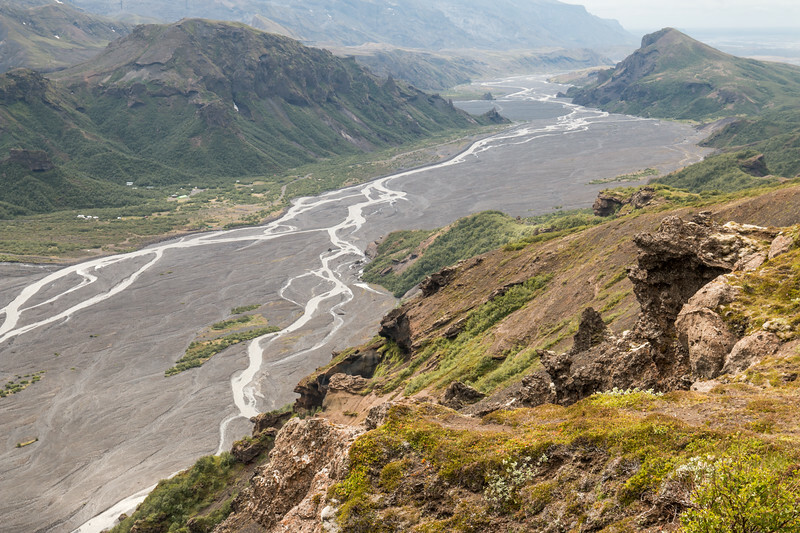 We recommend using Húsadalur (or Langidalur) as the starting point for your day hikes in Thórsmörk. 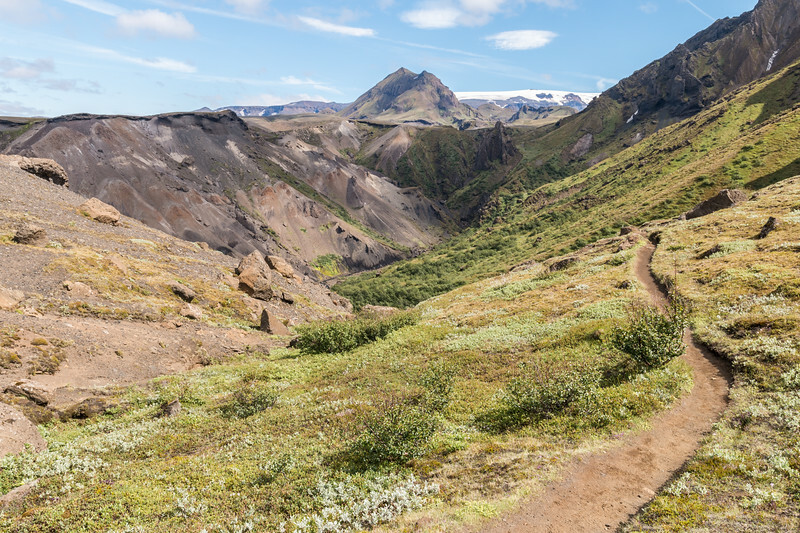 For a day of hiking in Thórsmörk, we recommend two trails – Tindfjöll circle and Valahnúkur. These can be put together for an amazing day of hiking with impressive views and landscapes. Another great hike is the one at Stakkholtsgjá canyon. 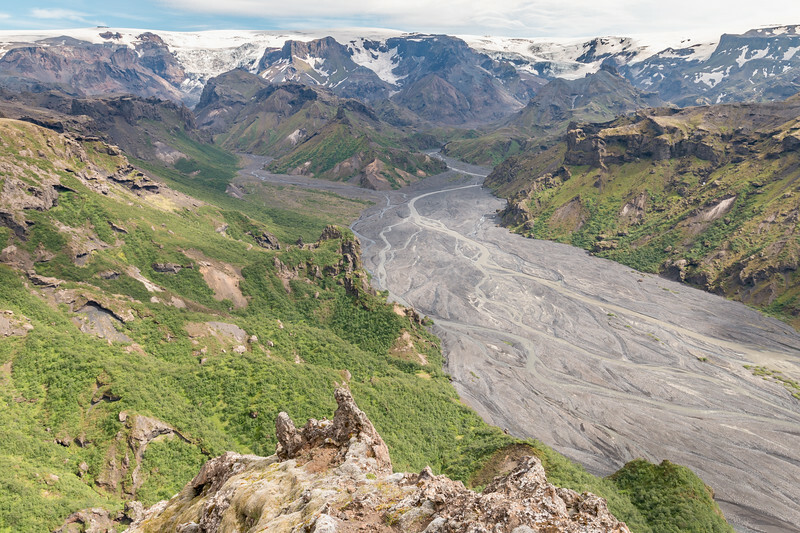 Tindfjöll circle is probably the best day hike in Thórsmörk and the longest of the short hikes, taking around 4-6h. 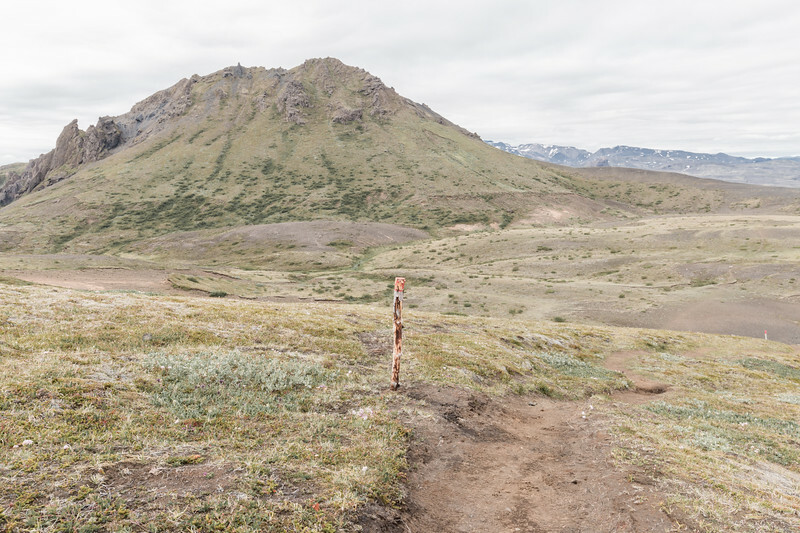 This is not the easiest of hikes as it includes some technical sections with narrow ridges and even a moraine to cross, but the views are definitely worth it. 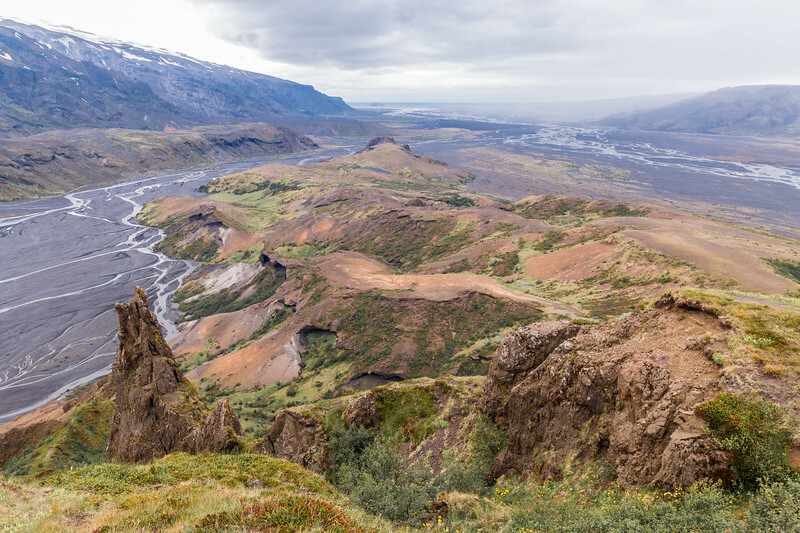 The highlight is the picture-perfect view of the Thórsmörk valley! With some care, this hike can be navigated safely but we wouldn’t recommend this to novice hikers. 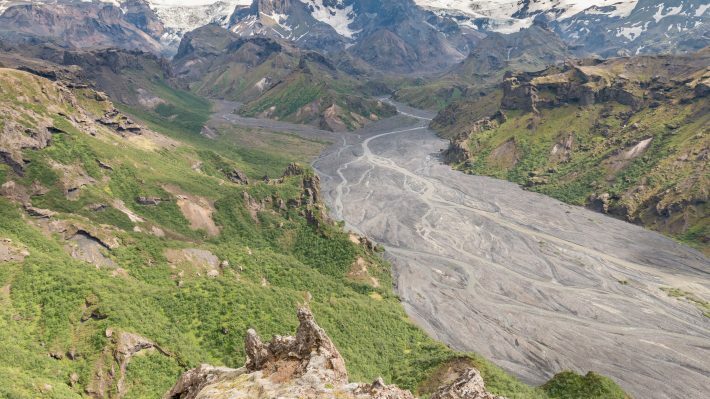 We’ll let the photos convince you to visit Thórsmörk and try this trail. 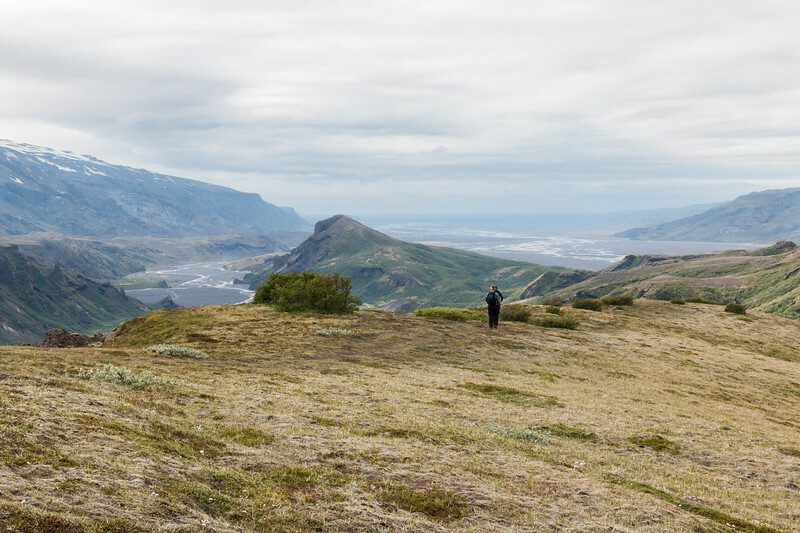 Valahnúkur is a short hiking trail that, at the summit, allows for incredible panoramic views over Thórsmörk and beyond. It’s easily accessible both from Húsadalur and Langidalur and perfect for those short on time or as an extra to the longer Tindfjöll circle. It takes less than 1 hour to get to the top but with such great views, you can easily lose track of time. It can be done as a circle by returning via the valley that connects Húsadalur and Langidalur. 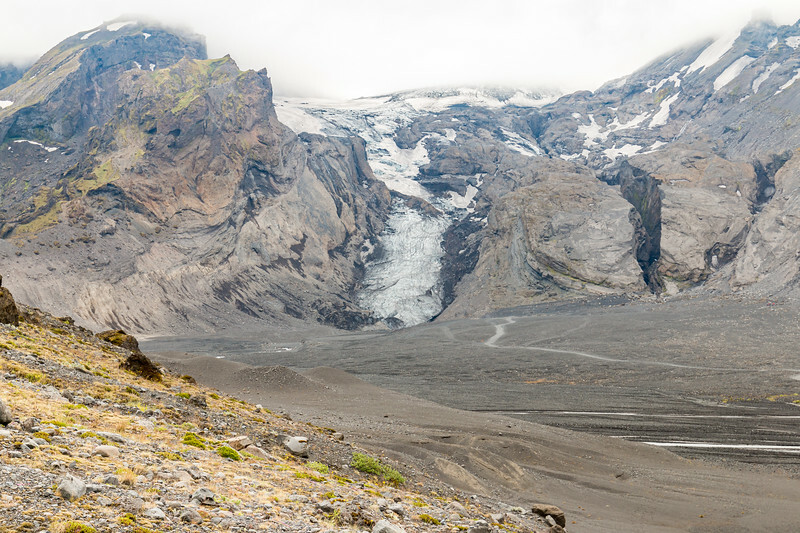 Thórsmörk is a hub for long distance hikes with two of Iceland’s most popular trails ending here – Laugavegur and Fimmvörðuháls. Laugavegur is the most renowned hike in Iceland, a trail that starts in Landmannalaugar and travels 55 km across incredible ever changing landscapes deep in the Highlands. It takes between 3 to 5 days and there are a few huts along to way to break the journey. There’s also an ultra marathon for those feeling super strong! 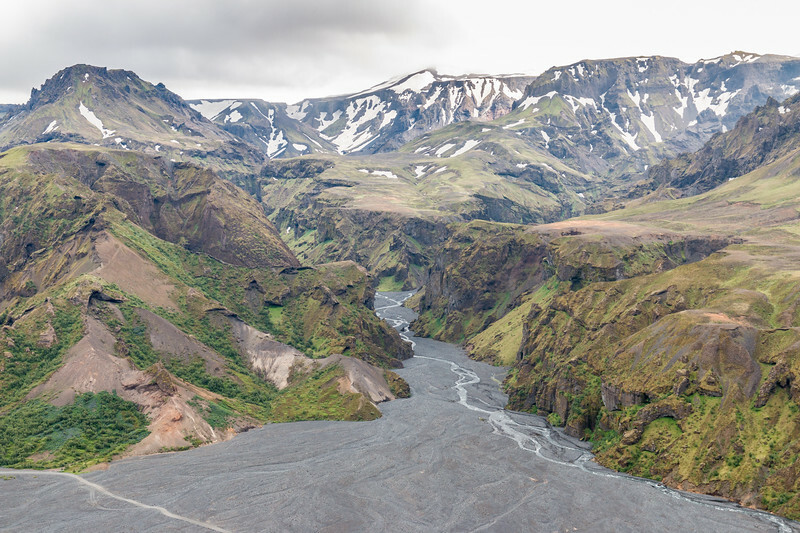 The Fimmvörðuháls trail traverses the area of the 2010 Eyjafjallajökull eruption, many waterfalls, and offers no shortage of incredible views. The starting point is at Skógafoss, one of Iceland’s most stunning waterfalls, and it takes around 10-12h to tackle the demanding 25 km. 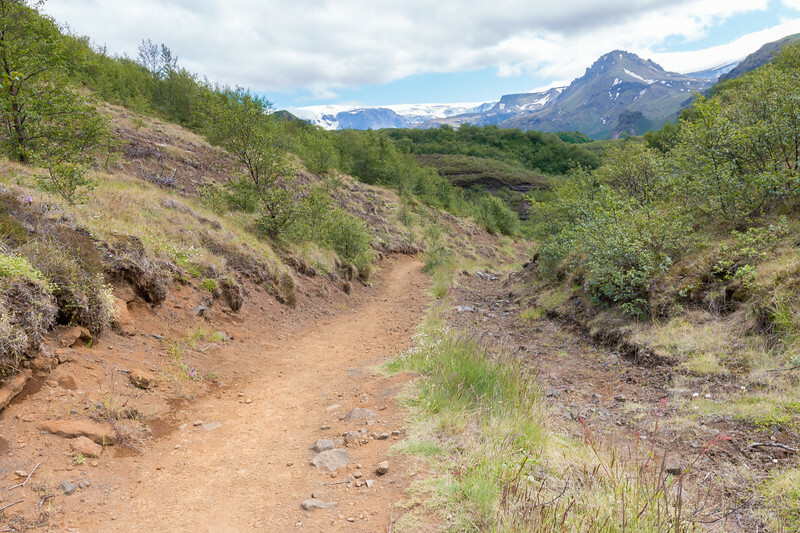 The ultimate combo is to hike the Laugavegur and Fimmvörðuháls trails together all the way from Landmannalaugar to Skógar. Allow 4 to 6 days for this adventure. The hikes and trails mentioned throughout this article take part in a remote and rough environment where the weather and conditions can change rapidly. It’s extremely important to be well prepared by using appropriate clothing and boots, knowing how to navigate, and carrying enough food and water. Are you planning to visit Iceland? What about hiking in Thórsmörk? Beautiful photos! Looks like an amazing hike. Whenever I see anything about Iceland, there are the waterfalls. I love that you actually for once showed the beautiful rivers as well! What food to you get in those Volcano Huts? There’s a bit of everything. Soup and roast were really good. I love the idea of visiting somewhere that is hard to get to 🙂 Makes it seem like such a special and rewarding experience! This place looks just like that. Beautiful photos, great tips on how to get there, helpful reviews of the different trails. Thank you! Exactly! It makes it even more interesting. My husband loves hiking, and these views show some amazing sights! I know he would love it. I’m a newbie hiker, so we couldn’t go together on the longer hikes, but the shorter ones we could manage. I wouldn’t mind trying on of the super jeep tours to get into the area — that sounds like fun, although probably a bit of a rough ride. Must add this to the list if Iceland is in the cards for us next year. Thanks for sharing! The shorter hikes are equally spectacular! Loved learning about this area of Iceland! Haven’t heard anyone talk about this yet. These hikes gave you some gorgeous views; I think my favorite was from Stakkholtsgjá canyon! Still off the beaten path due to the difficult access but truly spectacular. Iceland is very up on my list of countries to visit next, this post has just been bookmarked 😀 – Thórsmörk looks like an incredible trail and views wow!! Can’t wait to explore here, thanks for bringing it to my attention. Oh my gosh! I missed this on my travels to Iceland, but when I go back (not in winter) I want make this trek for sure. My husband and I are avid hikers, so this will be a perfect stop for the two of us! That canyon is stunning! This looks like the perfect place for your next trip then! What a fantastic looking hike. One of Iceland´s selling points is its incredible array of landscapes that seem to go on forever. I love a challenge and these hikes look like the perfect way to get to know this fascinating country. Thanks for the overview of short hikes – we did the Laugavegur, but obviously that’s not a short one! A four day trek but one I definitely recommend. If I may add something for hikers to Iceland to consider, please don’t make cairns (those carefully arranged piles of stones you see along the tracks). Ancient cairns are a natural part of the cultural landscape but it’s become an increasing problem that tourists are deciding to stack rocks to build their own. Yay. I want to do Laugavegur next year! Tourist cairns are just stupid! It requires a bit of 4×4 experience to drive there! My friend found few days ago tickets to Iceland, very chep one. We almost decided to buy them, cause Iceland is one of the places I just have to visit, but we realized that there will be no green grass, not even snow, just mud at this time (November) I have to wait some more! The scenery of this place is breathtaking and awe-inspiring. Hiking there would be a dream come true for me. When’s the best time of the year to go there hiking? It is! Summer, between June and September. Hi, Looks amazing.. if we leave the 4×4 rental car at the parking before crossing Krossá river how far before the Tindfjöll circle route starts ? Hi, you try and drive a bit further along the river (on the way to básar) and park close to the wooden bridge (it’s only there during the summer). And start there. The article was really helpful and the pics are mind-blowing ! I have a few questions, since we are debating whether to plan a hike ourselves or go with a tour company. 1. Do the buses drop us at the Volcano Hut ? 2. How do we get the Thorsmork hiking trails map ahead to plan the hiking route ? 3. Are the routes marked in any way ? Are the hiking paths clearly marked ? 2) you can buy one there (cheap). You can also get maps.me on your phone since it has all the marked trails. 3) There quite a few signs. I wouldn’t say they’re always clearly marked but easyish to follow.